Located on the northern shores of Botany Bay, La Perouse Headland provides spectacular cliff-top views across the Bay and out to the Pacific Ocean. It is also one of the most significant Aboriginal and European cultural heritage sites in Australia. Named after the French explorer La Perouse who entered Botany Bay six days after the First Fleet in 1788, the 10.4ha Headland incorporates listed cultural heritage values protected through creation of a National Park. Corkery Consulting was engaged by Randwick City Council to design and document a new section of Coastal Walk together with works to upgrade the Loop Road and associated parking. The site assessment included an analysis of views from the Headland as well as heritage values, recreation activities and connections to the adjoining National Park, Bare Island and waterfront open space. Implementation of the upgrading program was undertaken in collaboration with National Parks Service and consultation with user groups that include scuba divers, fisherman, cyclists, joggers and walkers. Heavy use and uncontrolled parking along the Loop Road had significantly impacted the quality of the Headland. Randwick City Council therefore made a commitment in 2007 to implement a major program of upgrading that included a new section of Coastal Walkway and extensive road works. The Coastal Walkway now provides safe and comfortable access for pedestrians around the Headland and connects to a regional coastal path system that will ultimately extend from Bondi Beach to La Perouse. Corkery Consulting was initially engaged by Council to prepare a concept for the proposed upgrade. Specialist sub-consultants were engaged as members of our project team. submissions and discussions with National Parks. Recreation opportunities catered for in the design include walking, cycling, picnicking, fishing, scuba diving and visiting the Museum. A significant improvement to the traffic flow was achieved by converting most of the Loop Road in to a one-way flow with roundabouts at each end to maintain convenient access to the adjoining shops and residential area. The parking layout was upgraded to create an entry area free of parking without reducing the number of parking spaces available. 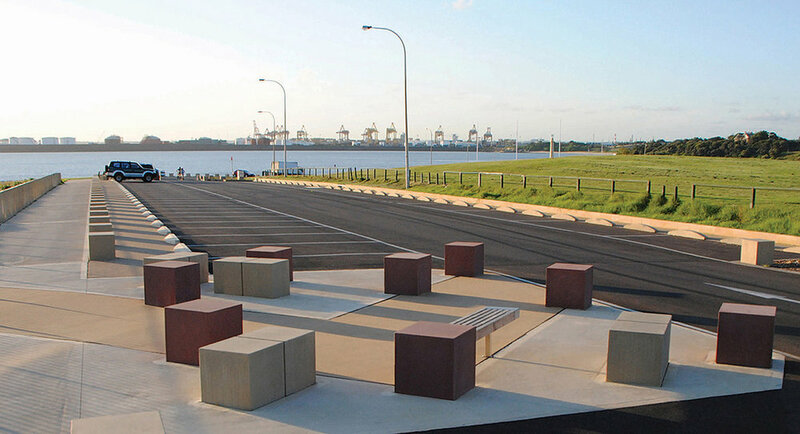 The installation of 245 pre-cast concrete bollards provides safe separation between pedestrians using the Coastal Walk and vehicles moving and parking along the Loop Road. The bollards also provide seating opportunities along the whole length of the Coastal Walk. Construction of 700 metres of 3 metre wide coloured concrete pedestrian path around the cliff-top edge of the Headland. Installation of 245 pre-cast concrete bollards to provide separation between pedestrians and vehicles as well as seating for visitors. Upgrading of 800 metres of Loop Road and creation of a one-way section of narrowed pavement to lower vehicle speeds and provide a more efficient parking layout that retained 220 car spaces. Removal of parking from the entrance zone to allow unobstructed ocean views. Installation of two roundabouts at the end of the Loop Road to allow 2-way traffic along the section of commercial development that includes shops and cafés. Creation of outdoor dining for two cafés along Endeavour Avenue at the northern edge of the Loop Road. Planting of ground covers and low shrubs was carried out with indigenous species adapted the particular coastal environment of Headland to contribute to biodiversity while minimising on-going maintenance.